Are you searching for TV shows to stream? Do you enjoy watching short-lived and/or forgotten television? If so, this guide is for you. Below you’ll find more than 100 TV shows you’ve either never heard of or you forgot existed, all streaming and ready to watch. Most of these shows were on the air for a single season or less. I’ve also included some shows that ran for two seasons or more, particularly if one or both of those seasons were short. Not surprisingly, most the TV shows included in this guide originally aired during the last two decades. But you can stream a handful of forgotten TV shows dating back to the 1950s. There’s some overlap, with certain TV shows available on multiple streaming services. Also, TV shows disappear from streaming services all the time, often without warning. Before sighing up for any of the subscription services, be sure to double check to make sure the show(s) you want to watch are still available. 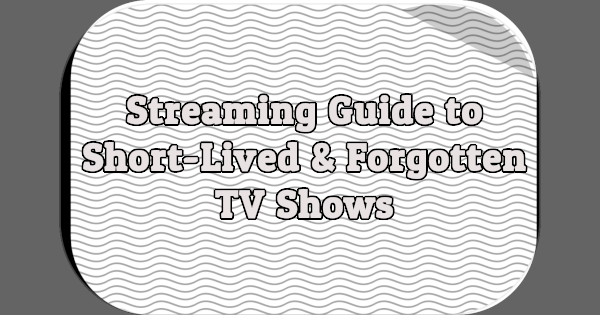 I’ll be updating this guide periodically but I can’t possibly keep track of all the TV shows coming and going on all of these streaming services. I’ll be relying on contributions from readers to keep this guide up-to-date. If I’ve missed any short-lived or forgotten TV shows streaming on any of these services, please let me know by leaving a comment or sending me an e-mail. Also, if you think I should include additional streaming services in this guide, I’m open to suggestions. On Hulu, I’d add Saved by the Bell: The College Years. And if 2 seasons qualifies: Land of the Giants and Car 54, Where Are You? NBC and ABC also have a “throwback” selection of shows on their sites — and ad supported. They are largely populated by short-lived in-house programs like The Cape, Outsourced, L&O: LA, Up All Night, and Smash on NBC; and Once Upon a Time in Wonderland, FlashForward, Reaper, Manhattan Love Story, Trophy Wife, and The Muppets on ABC. The one classic short-lived throwback is the original BSG on NBC’s site. Thank you for this. I have watched quite a few of the shows that are available via Amazon Prime. Unfortunately, most of these are US only services. Netflix in other countries has some different programming so availability varies. love it! so I can stream for free? Other short-lived shows: Hank, No Time For Sergeants, F Troop, My Mother the Car, Knight Rider. Also short-lived but immensely popular and well- remembered was Gilligan’s Island! The one and done Melrose Place revival is available via Prime. This list is cool. Amazon Prime also has Dilbert and recently added Gidget as well. Amazon Prime just added Booker, the 21 Jump Street spin-off. With new streamers popping up, it won’t be long before every lost series is up for download! Amazon Prime has 20 episodes of “Strike It Rich” (Syndication, 1986-1987; 1 season, ~195 episodes) available for streaming thanks to Buzzr. The show was pretty obscure and scarce prior to them being added back in January.